Would a storm put you off staying in a caravan on a cliff-top? 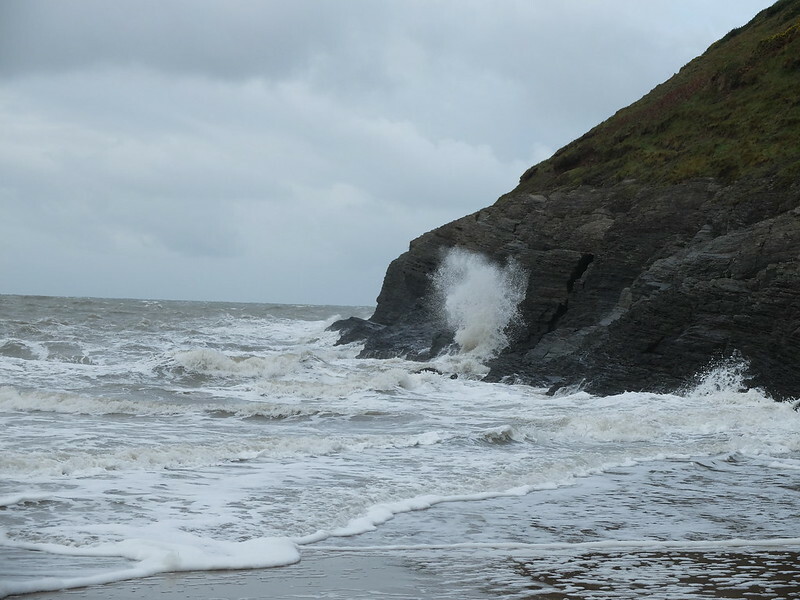 Storm Brian visited western parts of the UK this weekend, but we still went ahead with a last-minute weekend away to West Wales. A friend had very kindly said we could have use of their static caravan before the site locked up for the winter season, so as one never to say no to a free trip away, we packed up the car and headed into the eye of the storm. First stop en route was Newcastle Emlyn, where there are a couple of very good (and very reasonably priced) antique shops. We were last there a couple of years ago, just after we got married, and I remember buying a rather sumptuous 1960s' velvet and gold lame stole from one of them. The shops have a fair selection of clothes and jewellery, and I enjoyed trying lots of things on, including a Victorian mourning cape, and a beautiful 1940s' coat. Once again I was powerless to resist their wonderful selection, and I came away with a wool jacket from the sale rail, a belt, and a bed jacket. My husband found a classical guitar that tempted him, but he came away empty-handed. 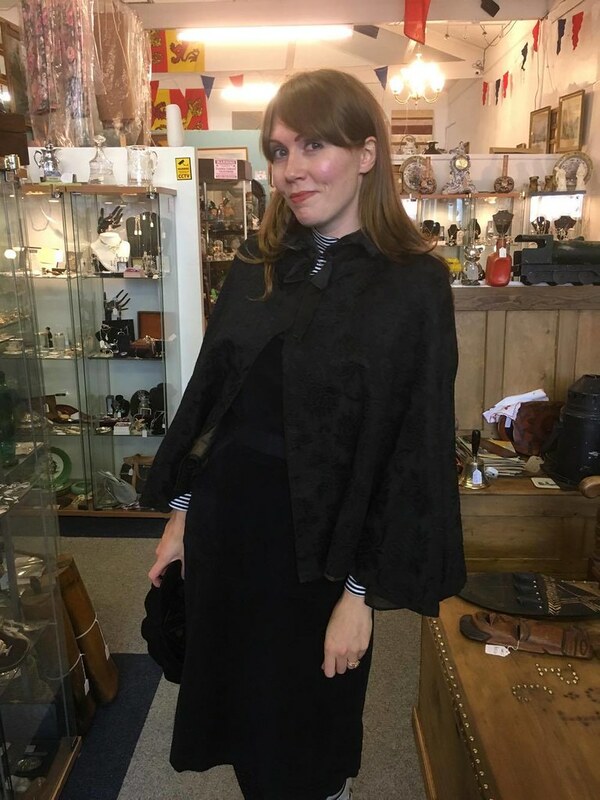 Above: I was rather taken with this Victorian mourning cape, and at £30 I was seriously tempted. Next stop was the town of Cardigan, and by this point the wind had whipped up and the rain had started. We dashed around a few charity shops and antique shops, and found a great house clearance warehouse that was full of 1970s' deadstock clothes. Alas, nothing in my size, but I enjoyed a good rummage on the rails nonetheless. 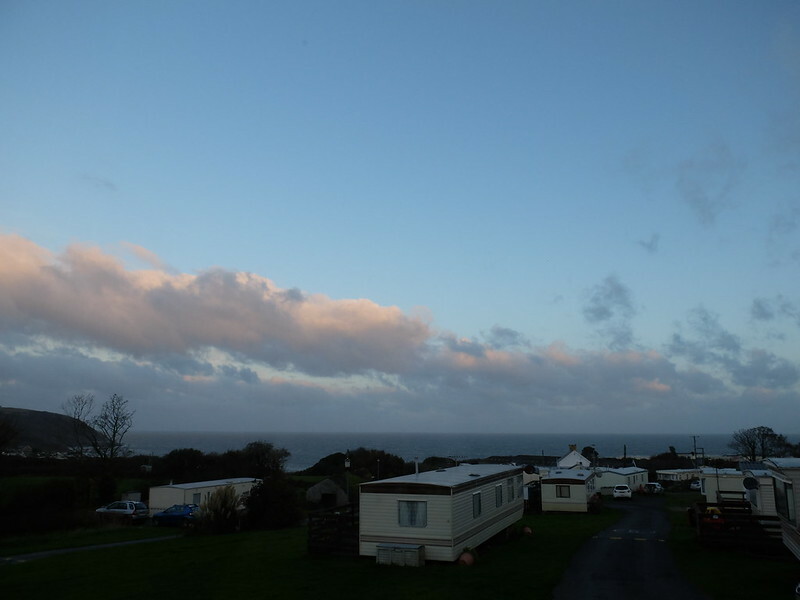 We arrived at our caravan site just in time for wine o'clock, and settled in for the night to brace ourselves for the gale-force winds that were forecast to hit us overnight. The next day, I was half-expecting to wake-up to find the patio furniture launched halfway across the site, but Brian didn't seem to have been too active in the night. From the sea-facing lounge window we could see a band of rain advancing towards us though, so we packed our waterproofs and boots and headed out for the day. First stop was Newcastle Emlyn again, because my husband hand't been able to stop thinking about that guitar, and decided to buy it. Heading up the coast, our next destination was Llanerchaeron, a Georgian house owned by the National Trust. The house was open but the woodland was closed due to the threat of high winds, and as it was starting to rain as we arrived, we headed straight indoors. 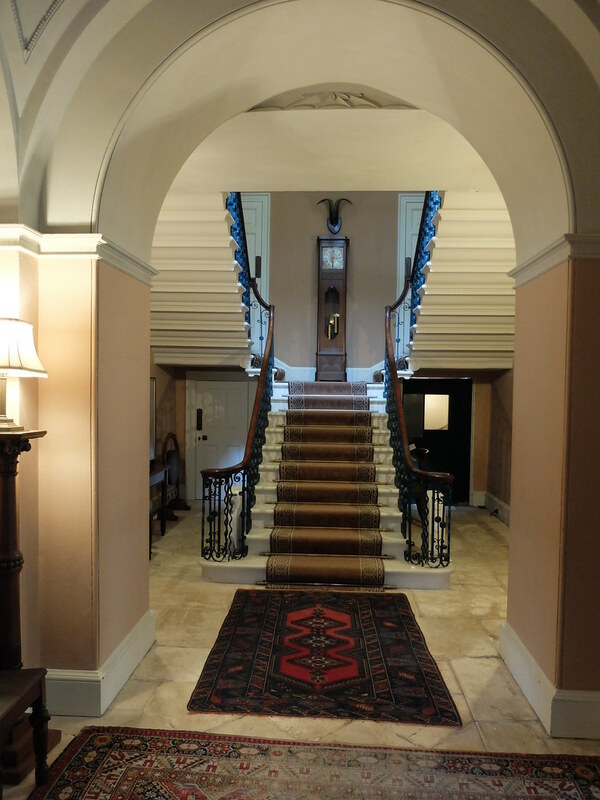 The house was designed by architect John Nash (he of Brighton pavilion fame), and is full of tricks to make it seem symmetrical, when it actually isn't. A modest-sized property, it was actually easier to envisage living in it than in some of the larger and grander National Trust properties we've visited. 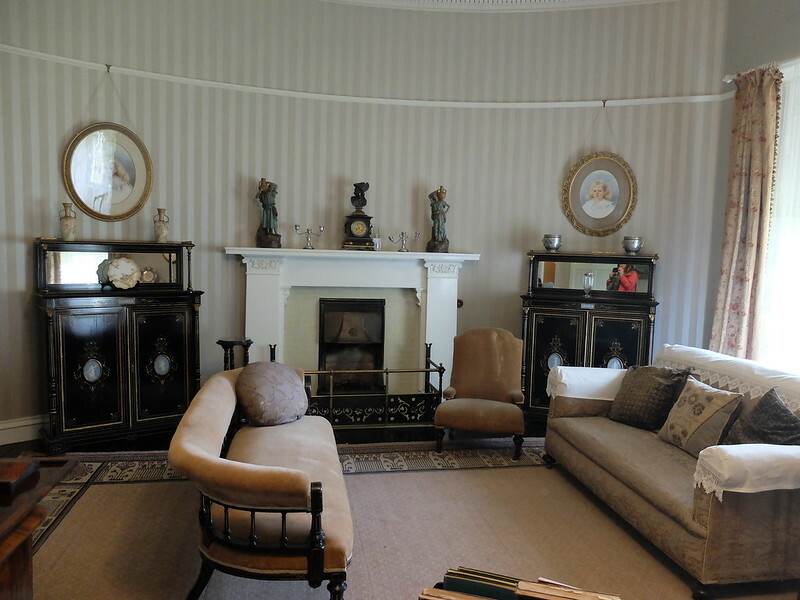 Although Georgian, the house is styled in keeping with the 1919 period, which is when its last owners moved in. 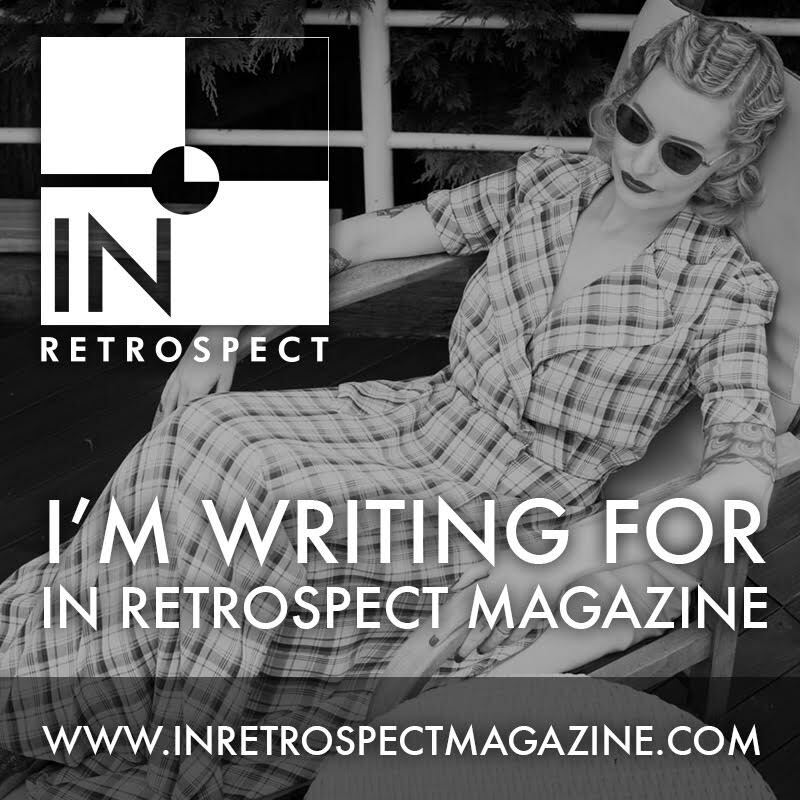 That meant that there was a lot to interest me, from Mackintosh style carpets, to decorative fireplaces and a few items of vintage clothing. Above: That window on the bottom left is fake! We headed back to the caravan then, for another evening of films and wine. We started watching Jackie, the Natalie Portman one, but we lasted barely 20 minutes before we both decided it was far too depressing. We watched a forgettable action-film then, but the real action was outside, as despite Storm Brian having passed by according to the weather forecast, in reality the winds were far stronger than they had been the previous night. I kept waking up in the night, thinking that we were in the Wizard of Oz! The final day of our trip was spent hopping around the coastline. 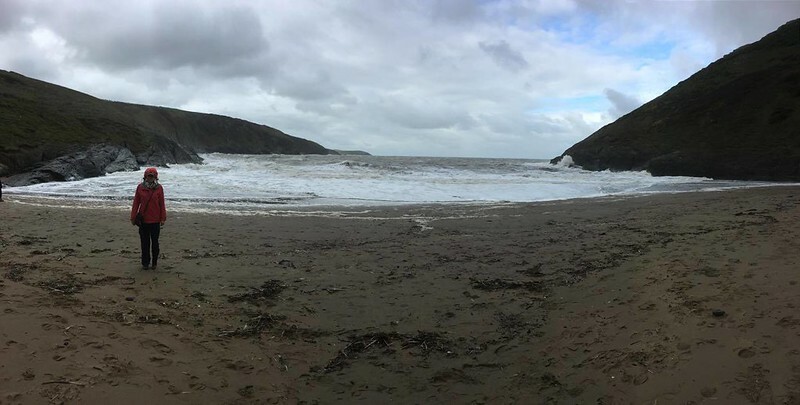 We visited a favourite National Trust spot, Mwnt, which has a lovely small cove. The last time we visited I think I paddled, but there was no way I was going near the choppy water this time! The waves were incredible. The wind was very strong too, so we were bundled up in waterproof and windproof clothing. There were still children playing sandcastles on the beach, that's the UK for you, got to make the most of it whatever the weather! Walking up from the beach, we headed to the small church. 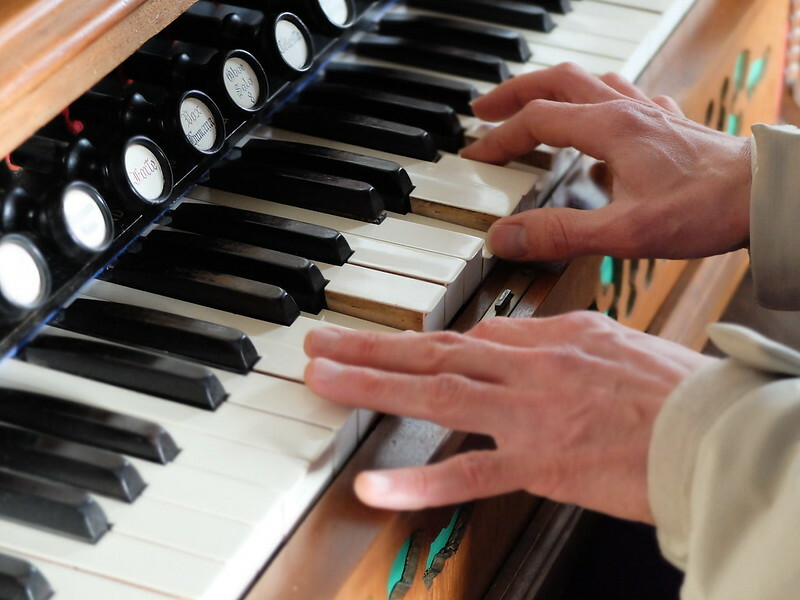 My husband couldn't resist having a go on the pump organ. 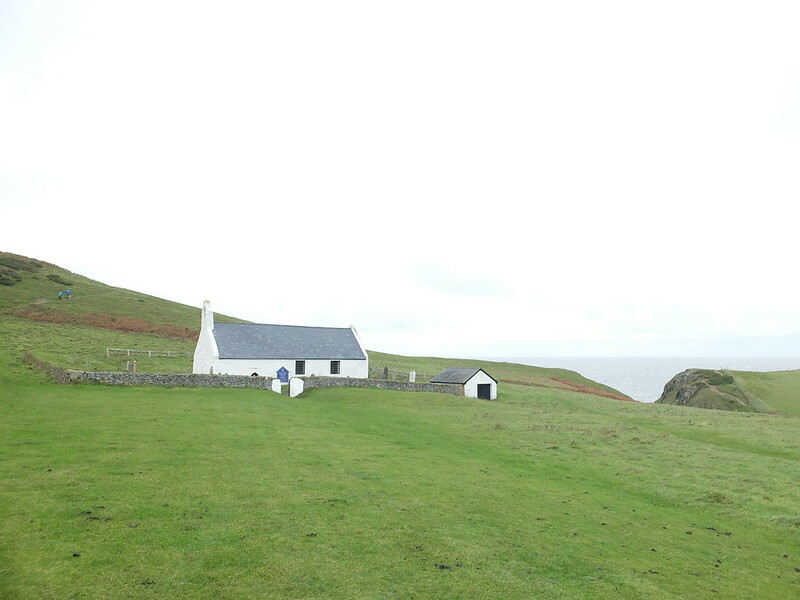 After Mwnt, we drove across to the little seaside village of Llangranog. 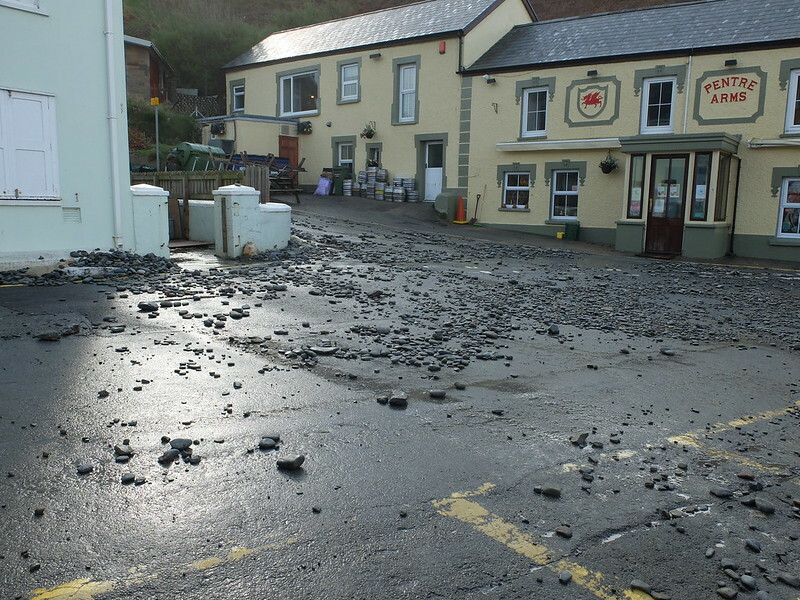 It was here that the force of Storm Brian was most evident, with pebbles and rocks from the beach having been thrown onto the road with the might of the waves. That brought us to the end of our impromptu weekend away. The skies cleared and we were even treated to a little sunshine peeking through, before we packed up the car and headed back to the valleys. I love that cape. I've been watching a lot of River Dale and swooning over a New York socialites wardrobe-a black cape features quite large. That is a nice little National Trust house - as you say, it's easy to imagine living there. 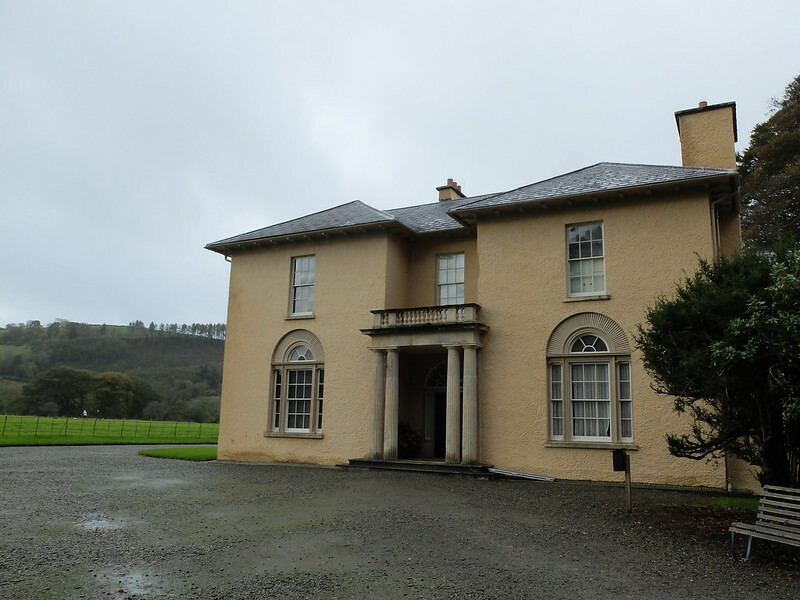 Have you seen the Landmark Trust is restoring one of the oldest domestic buildings in Wales to turn into a holiday let? 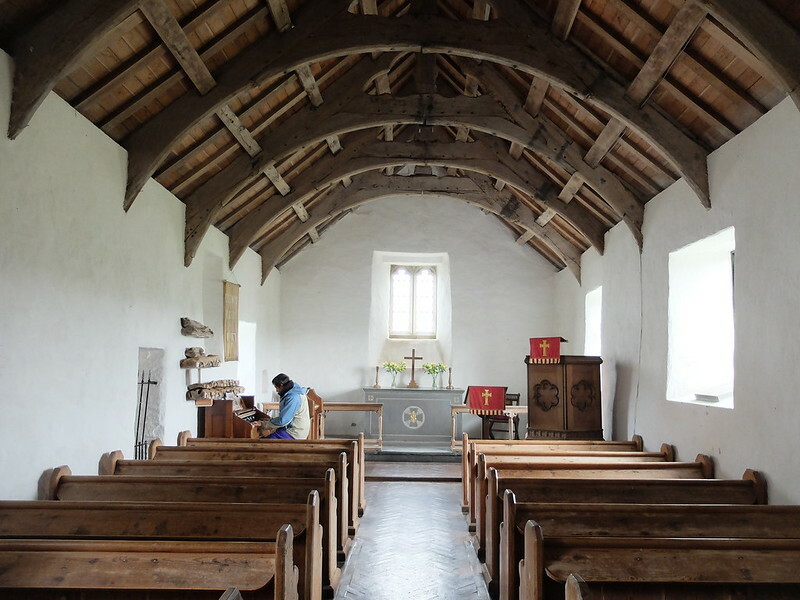 (https://www.landmarktrust.org.uk/news-and-events/latest-news/llwyn-celyn-oct17/) They've got a date for it, and it was probably built not long after Glyndwr's uprising. Isn't it mad that 1990s tat sells for more than Victorian clothing? The world's gone mad! 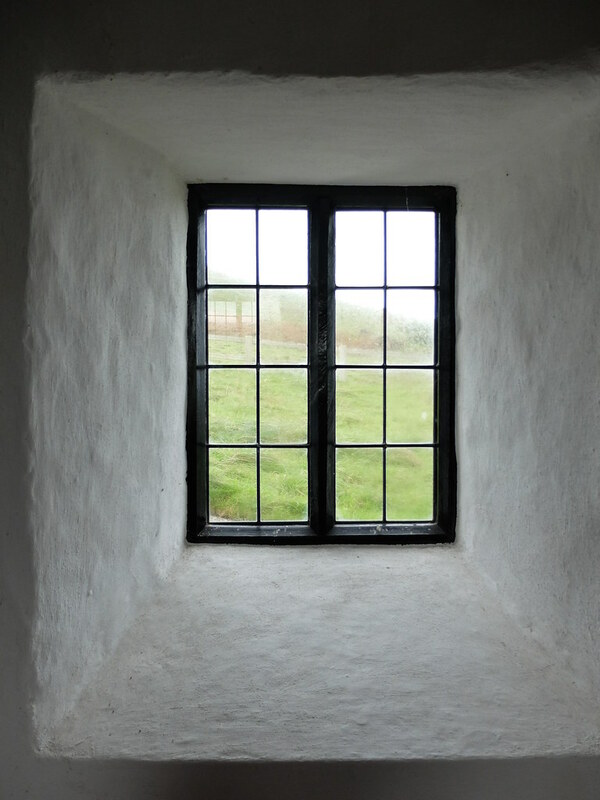 Love the NT property especially the faux window? Was that due to the window tax? That photo of you looking up at the sky light is gorgeous. Nash the architect was obsessed with symmetry, but also most particular about directions of views from rooms, hence the false window to satisfy both. Seems like a lot of effort to me!! That was quite the adventure! Always fun when you manage to come home with some treasures. I would have snapped up that cape in an instant. We NEVER get Victorian clothing over here. The few I've seen have been very pricey or rags. That fake window is insane. Love that you guys make a point of getting out despite the weather. Oh that cape is gorgeous! I have a cape made from a Victorian repro pattern which I made for a Victorian event. Must get that out and see if I can pull it off without a bustle! We certainly heard the storm but even the potted chilli sat atop the shed didn't budge an inch. I love the UK and we most of the times stay at holiday homes. Because we love it! 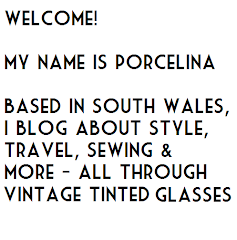 I have been once to Wales, it is so enormeous beautiful there! Thanks Nancy, maybe you'll visit again one day! I'm glad Brian didn't ruin you break, it looks gorgeous another place to add to the list! 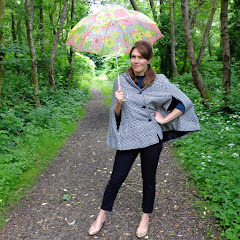 Love that cape, I don't know how you resisted it! It looks so perfect with your outfit, too. That house you visited is so lovely. 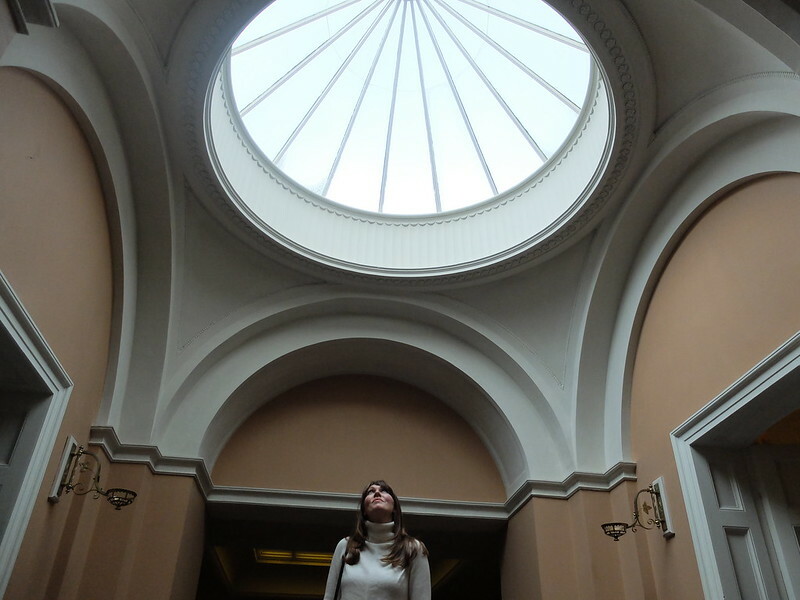 I really like that photo of you under the skylight - it really captures the airiness of the house. Sounds like you had a really nice trip!